2. In a large sauté pan, heat 1 tablespoon of EVOO and add onion. Cook for approximately 5 minutes until translucent. Add cauliflower rice, stir and sauté for 2 minutes. Transfer to a large bowl. 3. Toast walnuts by placing on a baking sheet in a 325 oven for approximately 5 minutes – watch and rotate so they do not burn. 4. 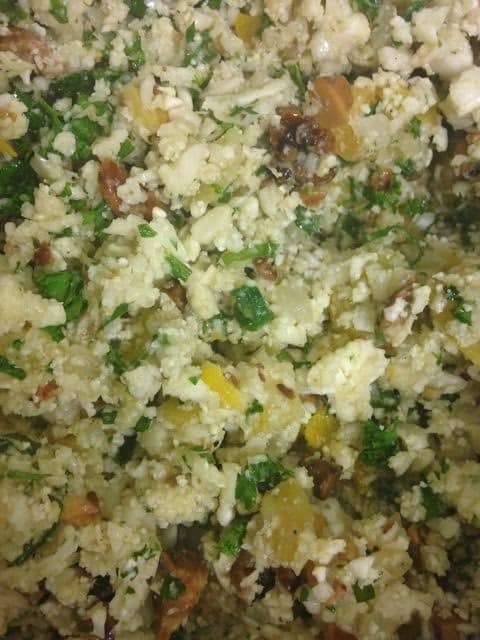 To the cauliflower rice and onion mixture, add the mint, chives, parsley, white balsamic, EVOO, apricots, toasted walnuts, salt and pepper. Toss well and season with a little more salt and pepper if needed. Serve room temperature. If made ahead and placed in refrigerator, drizzle a little white balsamic on top to brighten and raise acidity level, toss and then serve.